IP54 TGL 24964 Indexible to 1 Degree, 2 Axis DRO . Taper Attachment, Aloris Quick Chang Tooling, 35 to 1800 RPM. TO S Celakovice, Lathe, 32” Swing X 120” Centers, 7 to 900 RPM. 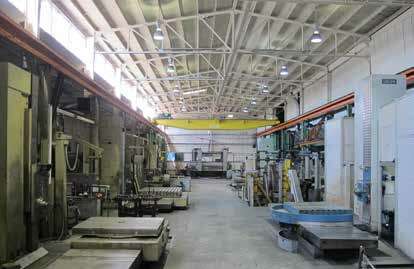 Oxegen & Acetalene Plate Cutting Table, MOC 3 CNC Control, 82” x 136” Cutting Table. Wasino, CNC Turning Center, Fanuc 10T Control, Live Tooling, LJ-103 LJ1034 2 1/2” Through Hole, 10” Three Jaw Chuck, 12 Position Turret, Mayfram 8” Chip Conveyor. Miller Aerowave, Tig Welder W/Gun & Coolant, 300 AMP. Webb 6FT initial pinch plate rolls, with 7’’ rolls. Johnson V-20, 20’’ vertical band saw with welder. Mattison 42’’rotary disc grinder, model 24. Marvel series 8 Mark III, vertical band saw with conveyor. Large selection of insp ection tools, calipers, mics, granite plate, and etc. Large and sm all angles, blocks, t slot tables, clamps, rigging equipment, sp reader bars. Taper, C Axis live Tooling, Chip Conveyor. Flexarm, 90 Degree Drilling and Taping, Manual Vertical Manipulator.